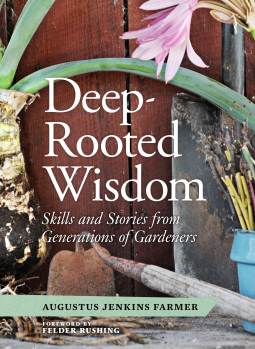 “Enjoy the mystery and get your hands dirty”, says Augustus Jenkins Farmer, author of Deep-Rooted Wisdom: stories and skills from generations of gardeners. This back-to-basics gardening book is full of luscious, lovely photos that add both to the art and craft of the book. It features horticultural personalities and stories about ‘the old (new?) way of doing things’ in the garden. Each chapter in the book is divided into three sections. The first outlines a gardening skill or idea and how it used to be used by gardeners or horticulturalists in the past. The second features someone who has taught the author about the older ways of doing things. In the third section, the author adapts these teachings for modern gardening. Along the way, we learn of the practices and consequences (both good and bad) of our actions in the garden, such as catastrophic soil depletion in the southern United States. Throughout the book we are treated to informative parentheticals relevant to the topic under discussion at that point in the book, on topics as diverse as Bokashi composting, mycorrhizal fungi, the plant collectors’ code of conduct, and the proper way to choose a hand tool. In addition, the book is infinitely quotable, and during my reading, I found myself writing down innumerable quotations to potentially use in this review. Farmer clearly loves the English language, and writes with a thoughtfulness and meandering intensity that reads as limpidly as poetry. But pithy as the book is, two quotes seem to best sum up the book’s contentions. The first appears at the beginning of this review. It is an exhortation to engage in the art and science that combine to make gardening so rewarding. The second is the observation that, “It’s important to remember that you don’t always need those material things on display at your garden store”. Look around you, get creative, and use what you have, or what you can find or borrow. Using creativity’s new eyes, much so-called “trash” can be turned to treasure, and we can do without much of what we think we need. This book is very much oriented to the South as a region; this is understandable in a book that draws on so much history and local wisdom, as the author lives in and is from the south. When I lived in the South, this book would have been even that much more interesting because of its regional focus. However the book is so enchanting that I found myself wishing for that kind of history and storytelling in a book that focused on my region. And perhaps one day I will find that book. For now, I can enjoy this one. I would recommend it to people interested in gardening, and people interested in the local histories of the South and Southern gardens in particular. It would be an indispensable part of any library collection in the southern United States. Note: I received this book as a free Advanced E-Reader Copy from NetGalley. This book will be available for general purchase on March 25, 2014.